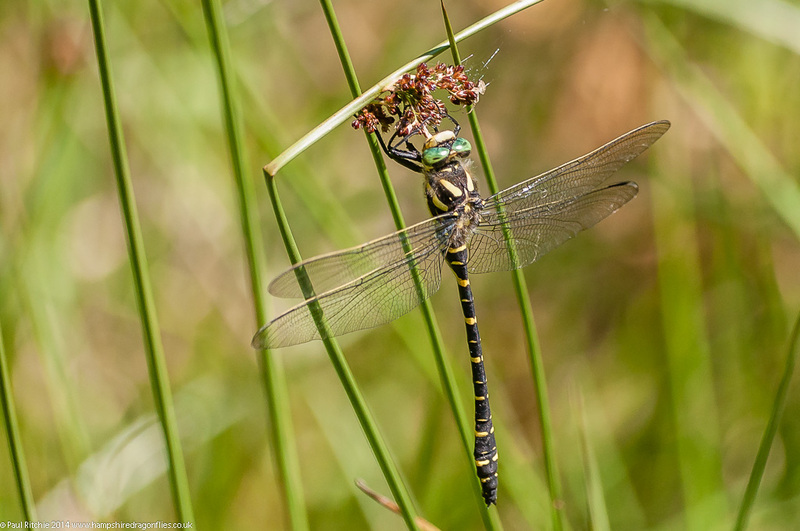 For three years we’ve been meaning to visit Priddy Mineries – specifically Waldgrave Pool – in Somerset, primarily for the strong populations of Moorland (Common) Hawker. On Saturday Doug, Sue and I finally got our chance. Constant longing through the experiences of friends (mainly Jerry and Mike from the UK Dragonflies forum) and study of Google maps hadn’t really prepared us for the treat in store. Our impression of a reclaimed industrial landscape didn’t at first appear to offer a particularly tranquil experience, despite it being an SSSI, but how wrong can first impressions be? An anomaly in the limestone terrain of the Mendip Hills turned out to be an unexpected paradise. Unfortunately neither Jerry or Mike couldn’t provide a guided tour on this Saturday due to other commitments, so we had to make our own discoveries without the benefit of local knowledge, but it wasn’t long before we found the prizes this fantastic site had to offer. I had expected the causeway to be a concrete structure bordering a reservoir with little access to explore much of the shoreline, but this proved to be far from the truth as we headed for the western edge where are target were seen in an abundance we’d never experienced before – including the fabulous Gower Peninsular in South Wales. 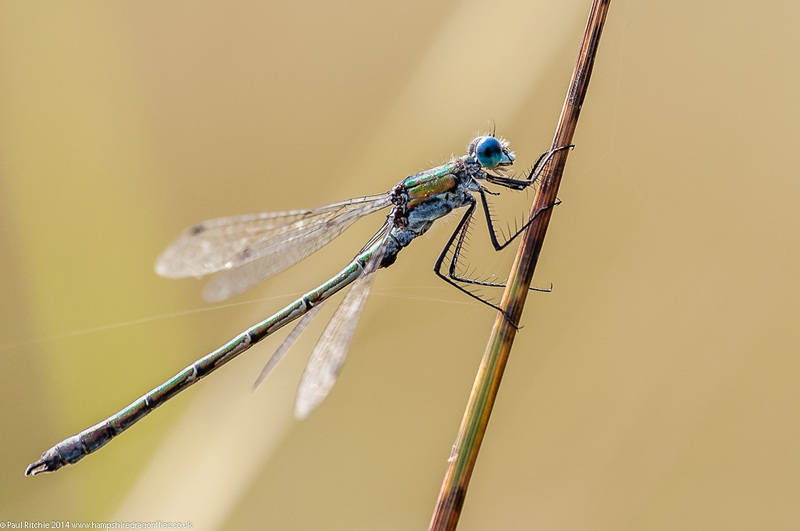 At least five males were patrolling the bare and shallow boggy area, weaving in and out of the reeded scrub along the shoreline seemingly not bothered by the lack of water, constantly dipping into the peat and rarely rising above a few feet from the surface. The first thing which strikes you about this magnificent hawker is its inquisitive nature; very much like its cousin, the Southern. 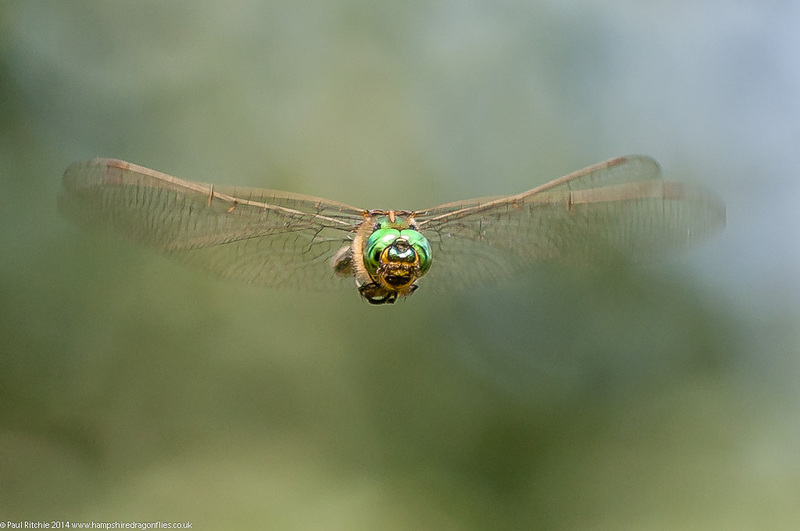 Constantly flying close in and circling , making it a challenge to get an in-flighter with a long focal length. On several occasions I considered switching to macro. The second thing, and somewhat surprising, was the sociability of the species; several males able to tolerate each other and share space with little or no aggression towards each other. 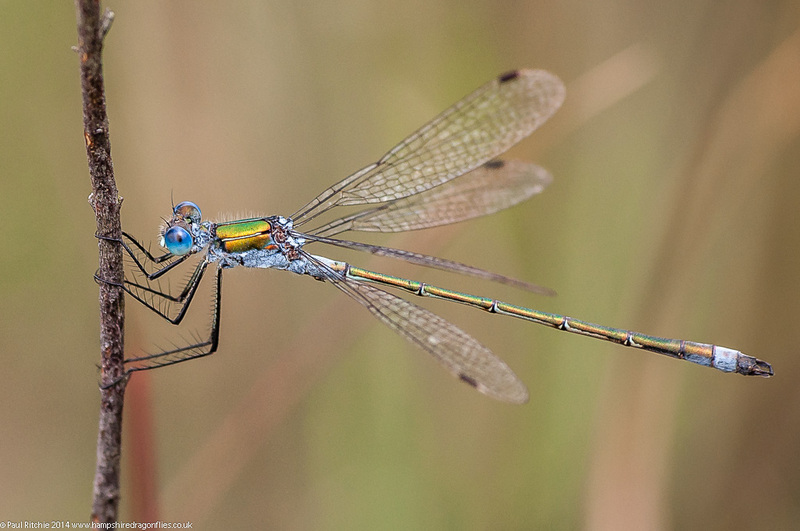 This made for a very fine display; one of the best dragonfly displays I’ve seen. We also had three females fly in to oviposit, one in the bare brown boggy surface. The only gripe we had were the sight of several pairings rising from the pool and disappearing up the hill at a distance to far to follow, and the seemingly endless flight of the males not once offering the chance of a perched opportunity – yet. 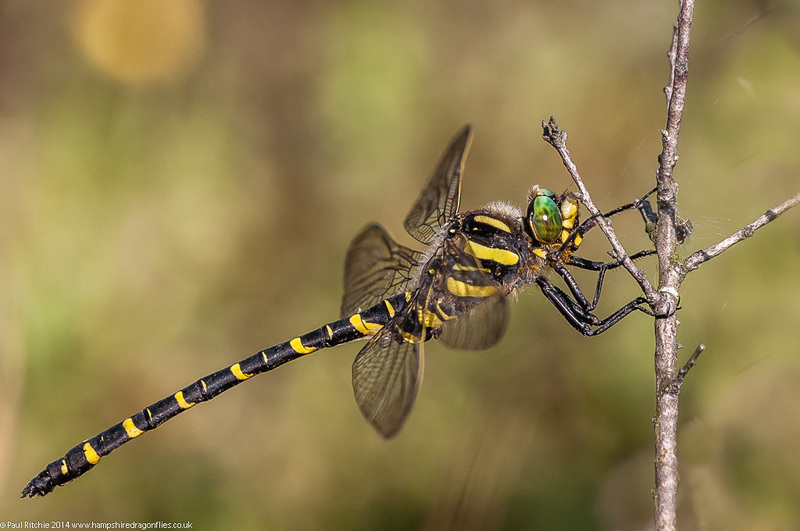 Among the other species present were good numbers of Black Darters, Common Blue and Emerald Damselflies, a few Emperors and a couple of Brown Hawkers, one of which surprisingly took out one of the male Emperors, dunking it in the water with such violence that we thought he was finished. Defeated and exhausted he managed to rise from the surface and retreat to a nearby perch to catch his breath before returning to his own patrol some distance away. A good five hours was spent at this fabulous pool, and when the action began to slow down at 5.00pm we reluctantly made our way back to the car, and then I noticed one rise from the pool to land a short distance away head-height in a tree. It’s a telling tale when you can spend two hours at Christchurch Common and have more fun than five hours at Warren Heath. Warren Heath is all well and good, but on Tuesday it was a tad disappointing. 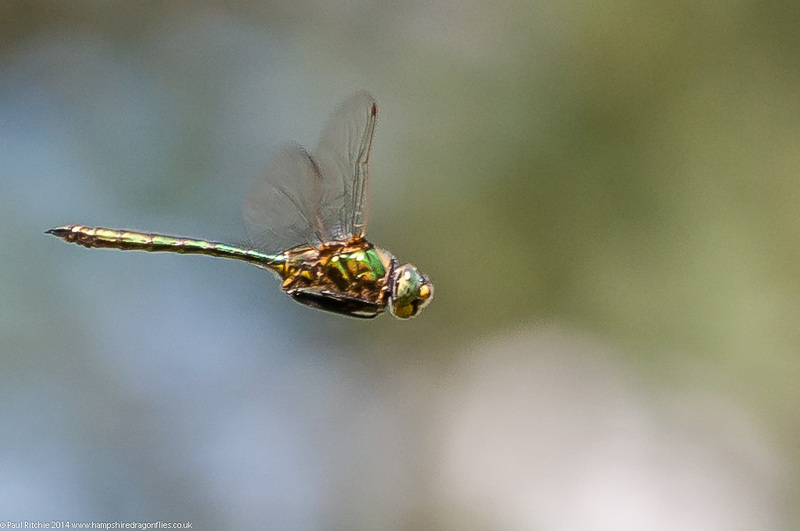 Sure, I had a few moments with the Brilliant Emerald, and even had one perch twice, but to be brutally honest, the experience wasn’t anywhere near as good as the two days I spent at Ashdown Forest. Certainly on my visit things were very much subdued compared to last season. 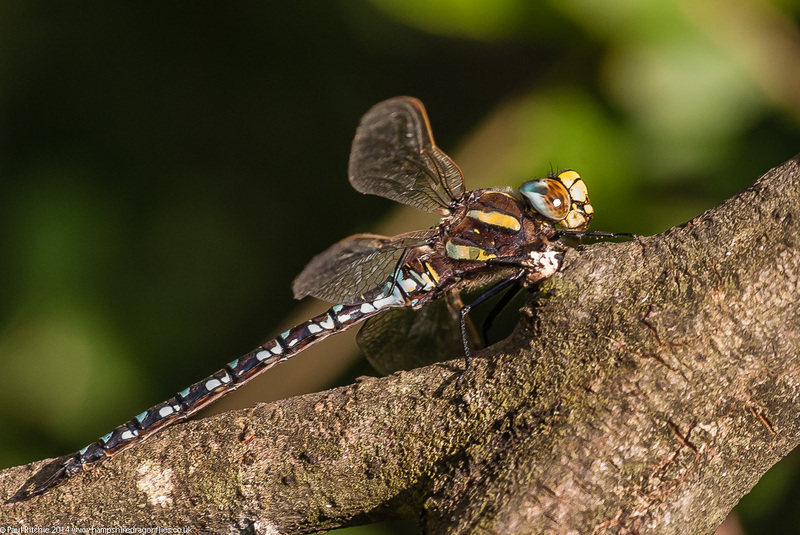 At this time of year I expected to see at least half-a-dozen male Brown Hawkers and equal amounts of females ovipositing, but not this time. 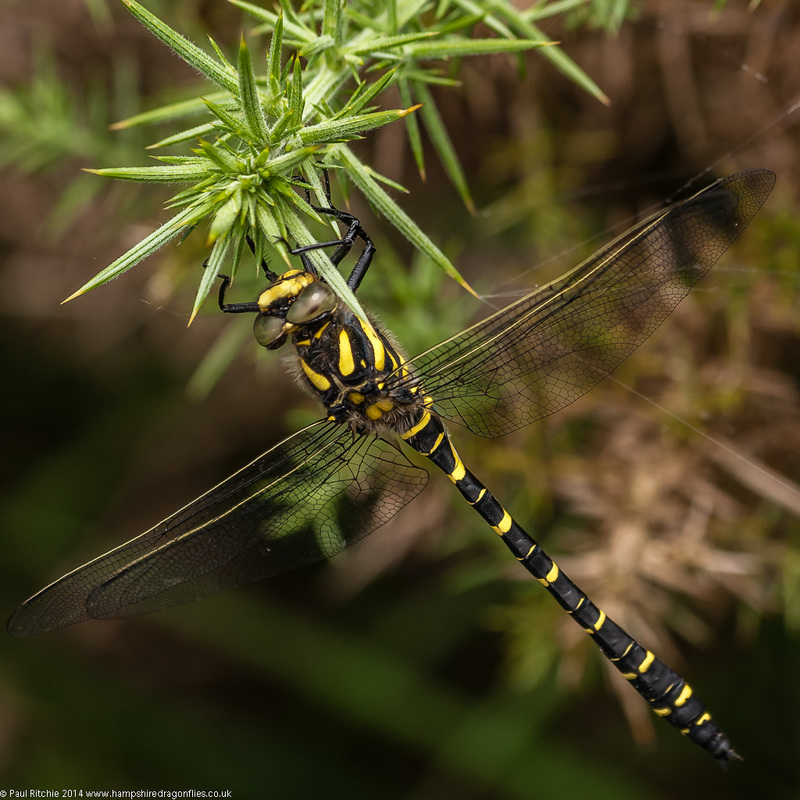 I was pleasantly surprised to bump into Chris Brookes – a long-time dragonfly enthusiast and photographer – who informed me that 10 years ago Warren Heath used to be superb, but had gradually gone downhill to neglect, and if anything Bramshill Plantation is the better choice these days. 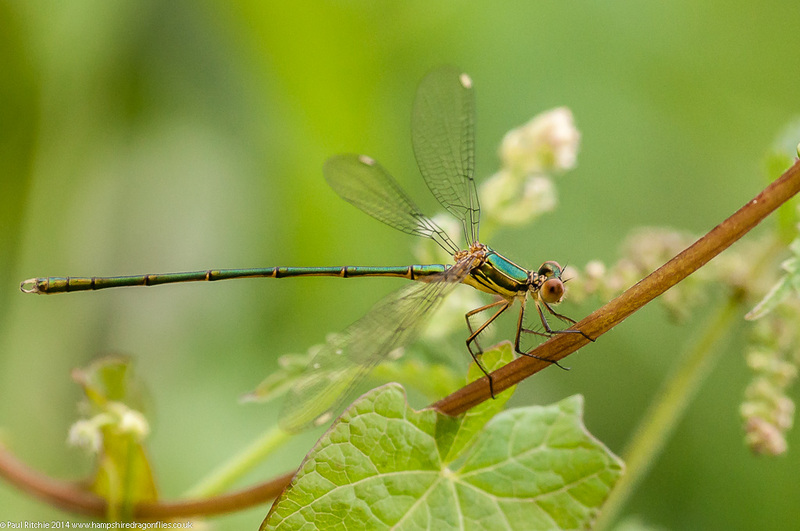 The stream apparently used to produce at least half-a-dozen Golden-ringed, but the foliage had increased to a level which was uncomfortable for both dragonfly and human; the path more or less concealed making every footfall precarious. 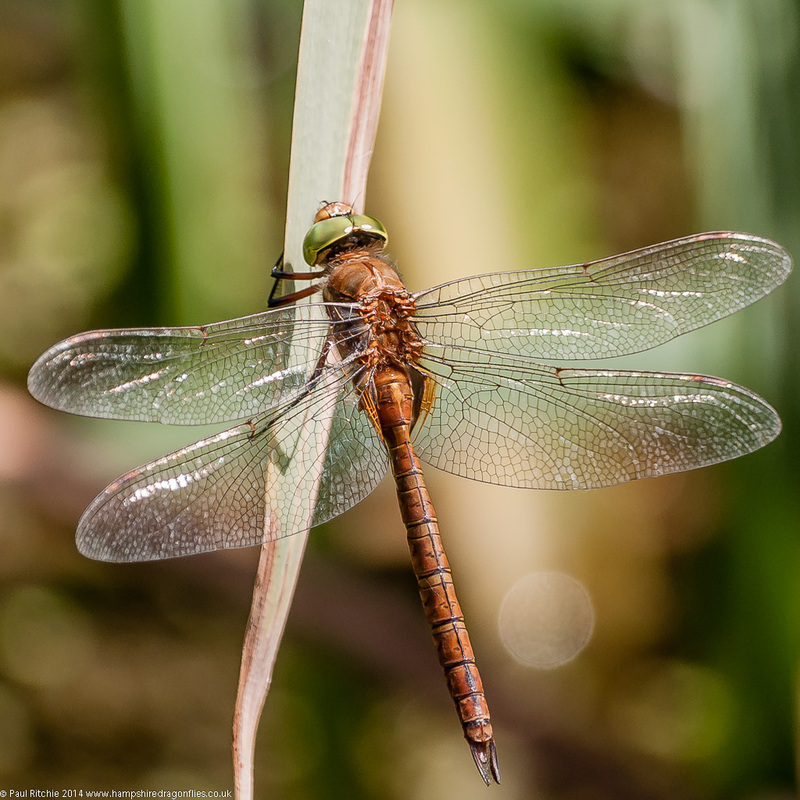 A saving grace was the clearing which still managed to provide Black and Common Darters, Keeled Skimmers, Beautiful Demoiselles a few immature Common Darter and a patrolling Brown Hawker. 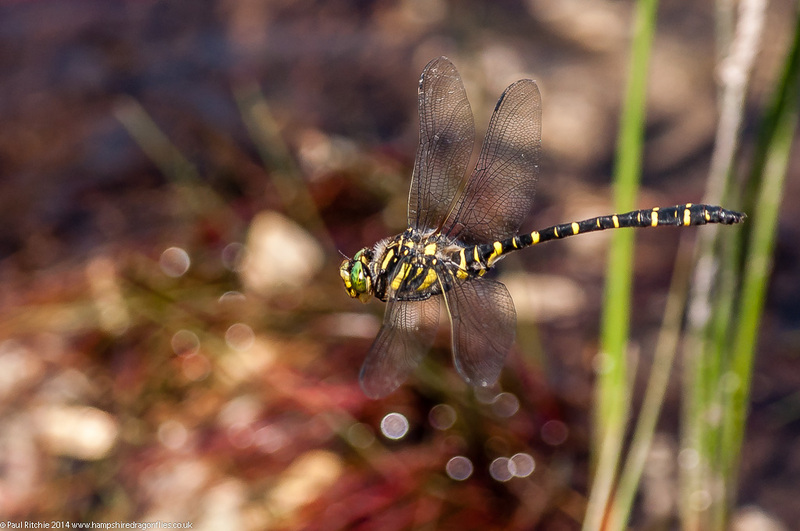 Chris kindly pointed out this perfectly-perched female Black Darter. 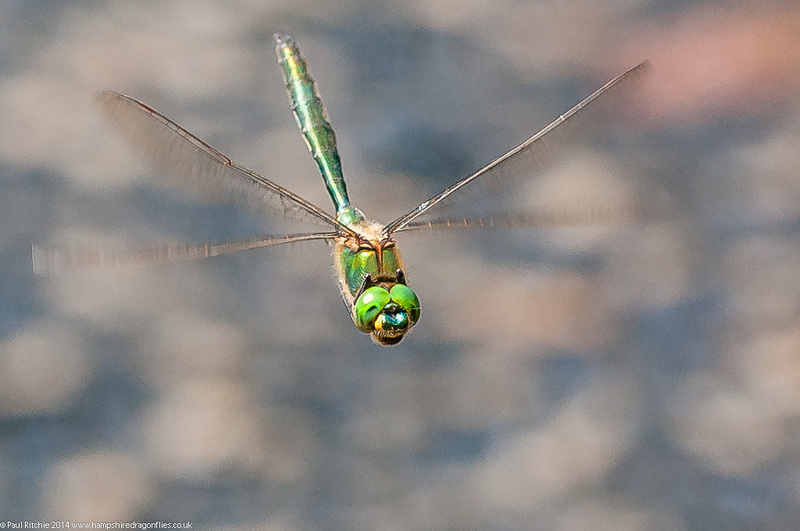 A male Southern Hawker appeared briefly over the reservoir, and Downy were still (annoyingly) present ready to scare off any appearance from visiting Brilliant. 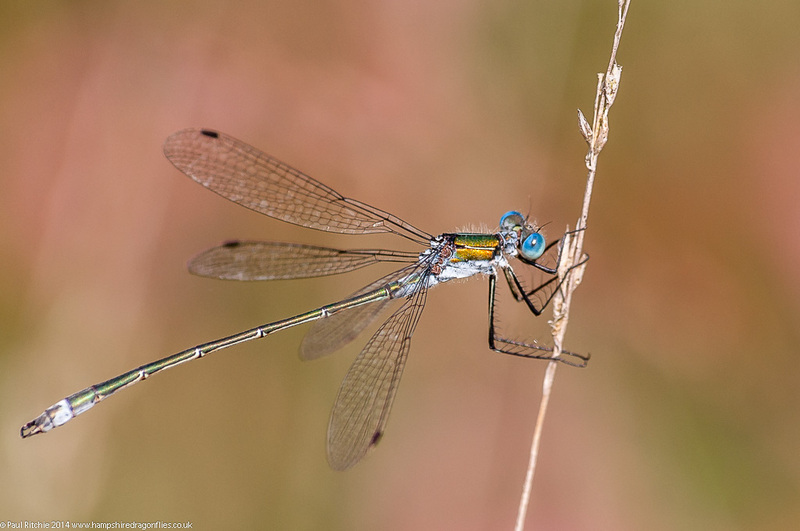 A bonus were the Small Red-eyed damsels which I kept an eye out for after being informed by a regular visitor. 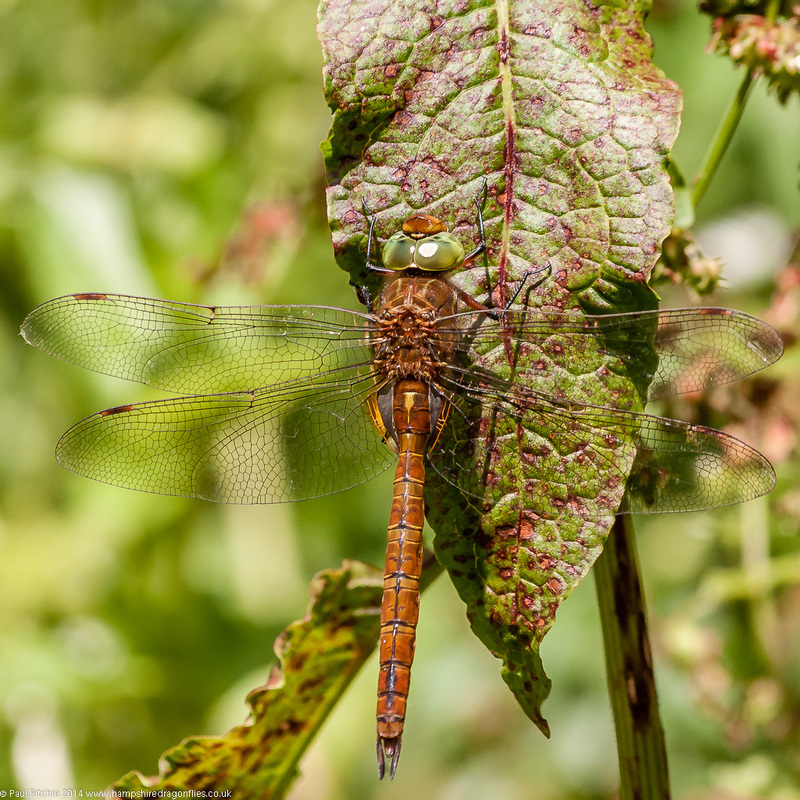 Christchurch Common was a far more enjoyable experience; very hot and humid with little shelter, but still plenty of Black and Common Darters and Emerald damselflies to keep me amused. 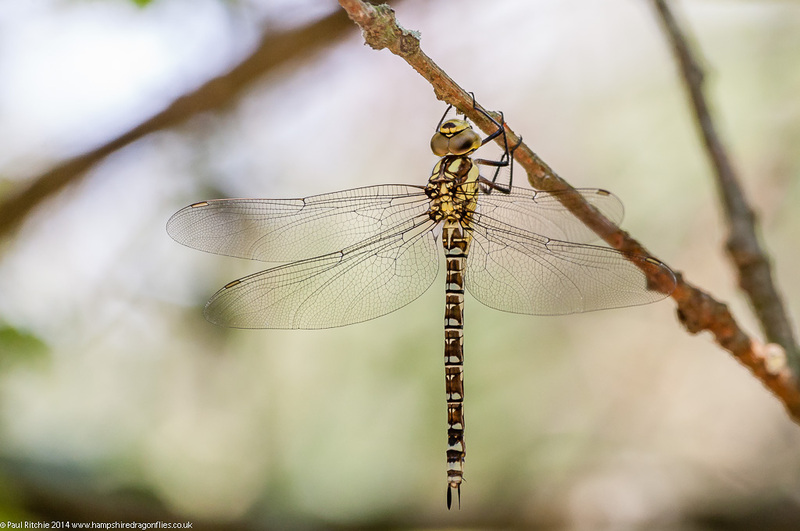 Some of the pools were close to drying out completely, but this didn’t seem to bother the pleasing displays of all the above plus Four-spotted and Broad-bodied Chasers and at least one male Emperor on each with the occasional ovipositing female. 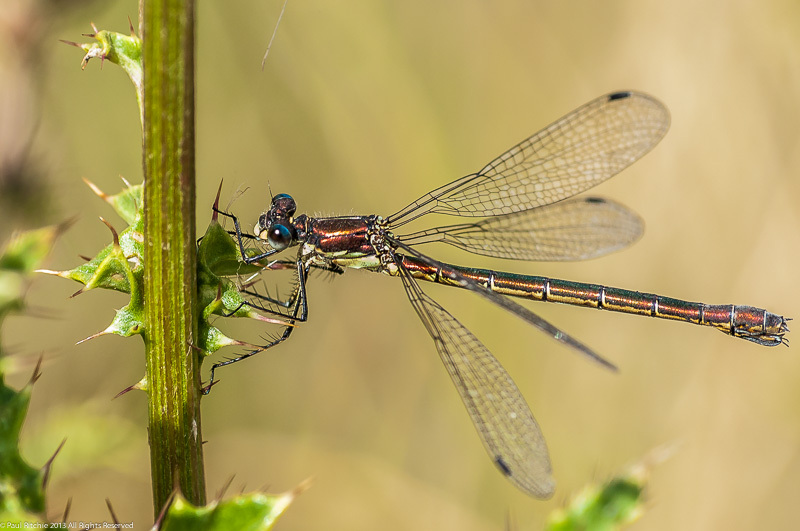 Small Red damselflies were scattered throughout the heath, and a pleasing sight were yet more male Emperors and the occasional Brown Hawker hawking across the heath itself. I’d promised myself to keep the walking down to a minimum, but couldn’t resist a stroll to the far end to take in the bulk of the old railway, being greeted by crossing Common Lizards and a Buzzard who was just about to perch on a telegraph pole before spotting me at the last minute and changing its mind. Further along an immature Migrant rose and disappeared, and back at the crossroads an immature female Southern Hawker kept me busy as she chose a perch almost perfectly concealed within the branches of an overhanging tree. I called in to Ramsdown afterwards for a gander, hoping a few hawkers would be feeding in the clearing, but maybe it was still too early in the day – or indeed the season – for the spectacle. 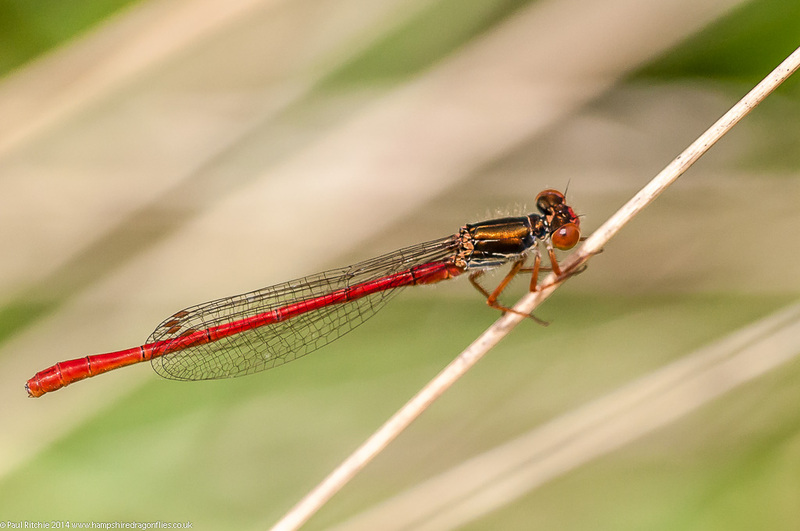 The pool below Ramsdown Hill offered the best activity with a repeat of the species listed above, including a higher and healthier population of Small Red damsels. 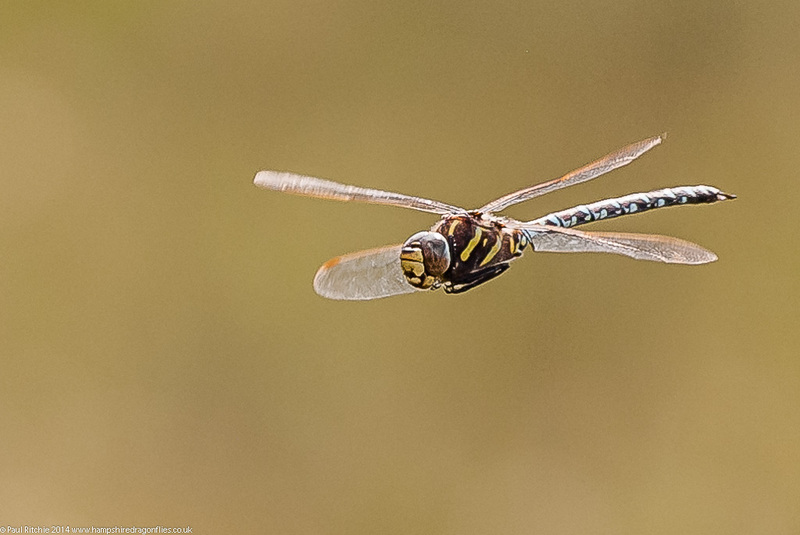 A brief call in at the all but dry pool at least provided a male Common Hawker to complete my local species list for the year. Not entirely, and there were some (unexpected) pockets of high activity, but some of the ponds I visited deserved a lot more. I had arranged to meet Robin Procter for an introduction to Crockford Stream, and on the way called in at Ipley Cross to check out Rushbush and Dibden Bottom ponds. 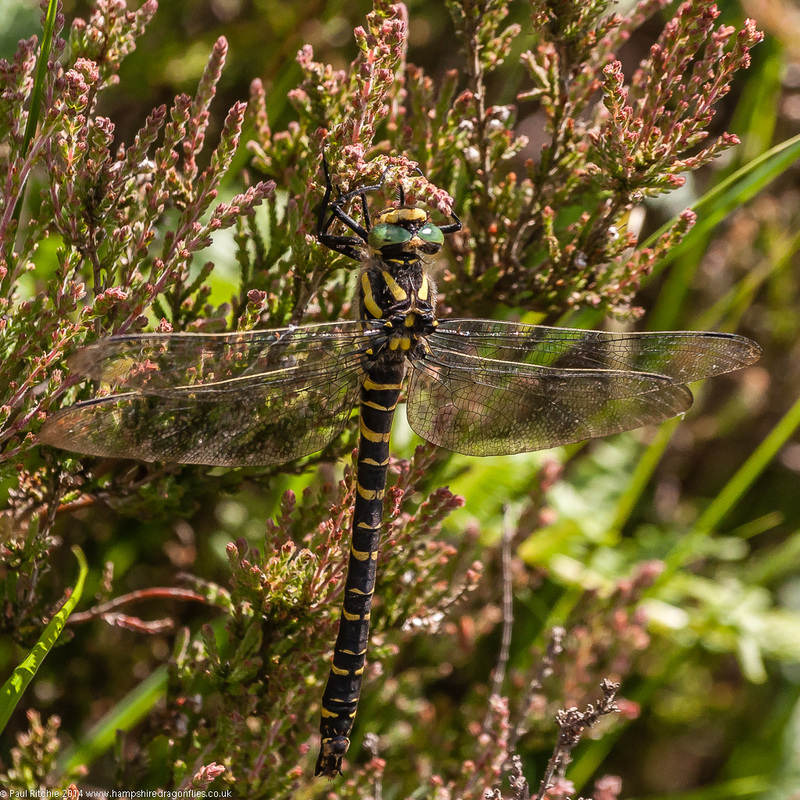 At the former there were a few Four-spotted and Broad-bodied Chasers and a couple of patrolling male Emperors along with the usual damsels, mainly Common Blue as the Emeralds preferred the sanctity of the surrounding heather. 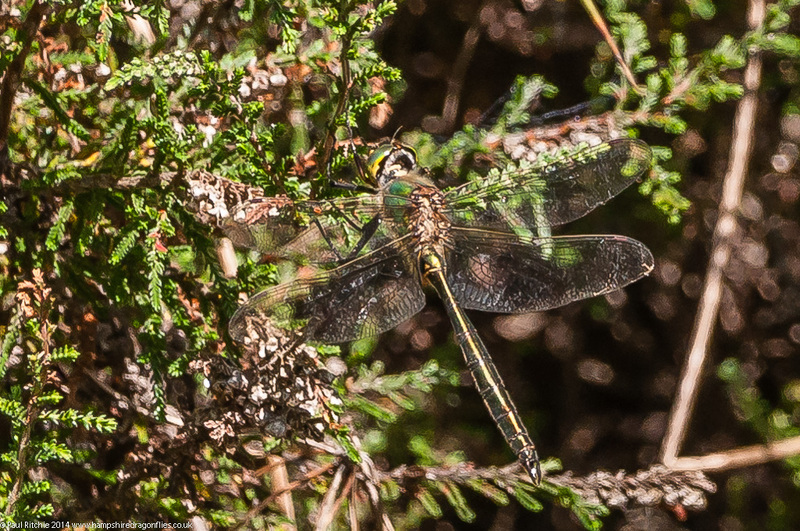 I didn’t scour the surroundings too closely, preferring to encounter rather than seek out, and the heath was certainly more plentiful at Dibden Bottom with a stronger population of Common Emerald. 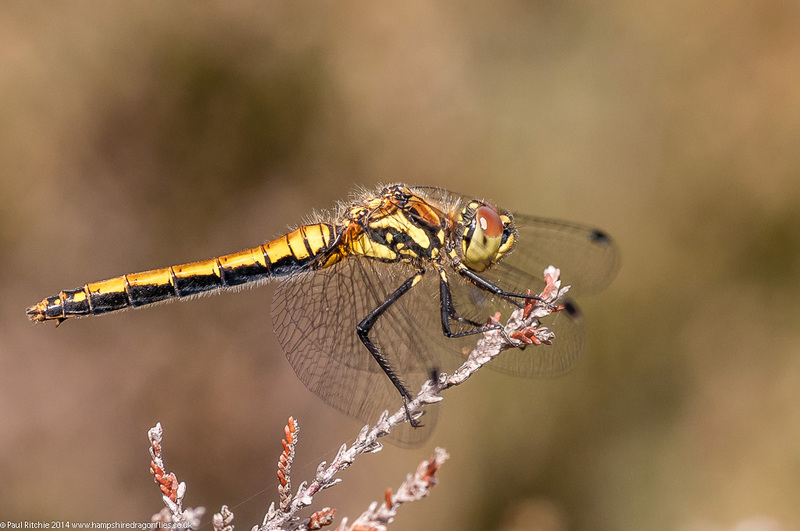 Black Darters were also nervously rising from the heather, and the pond itself repeated the list of Rushbush with a few of the latter braving the windy waters. Around the thicket at the smaller heath pond were more of the same, with several mating pairs decorating the heath and, you’ve guessed it, another male Emperor holding court. 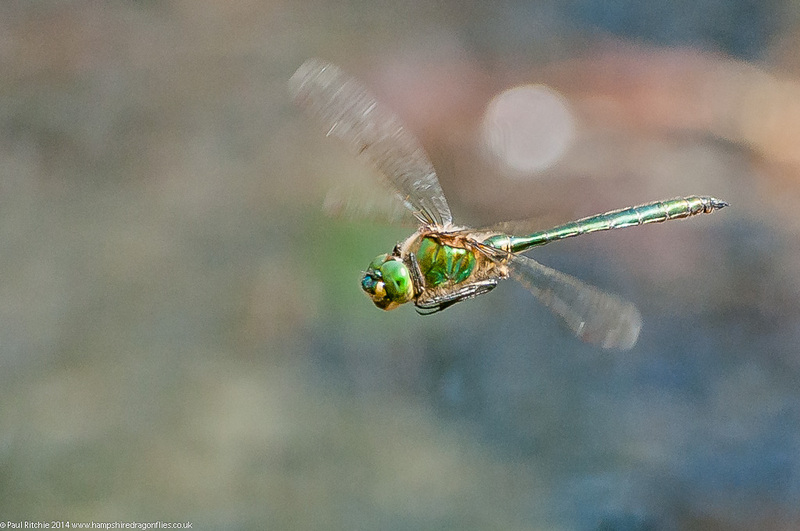 The windy conditions didn’t offer many opportunities, but I managed a Common Emerald. Furzey Pond across the road is all but ruined with the surrounding gorse and heather razed to the ground, offering no natural shelter. 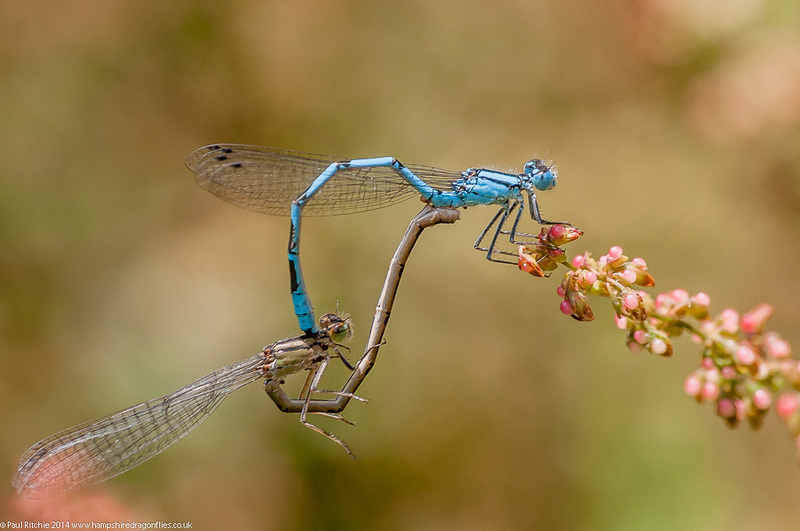 Even the Common Blue damsels had sought other locations. Our meeting place was Hatchet Pond, and while I was waiting for Robin’s arrival I took a stroll around the sheltered corner which was a hive of activity. 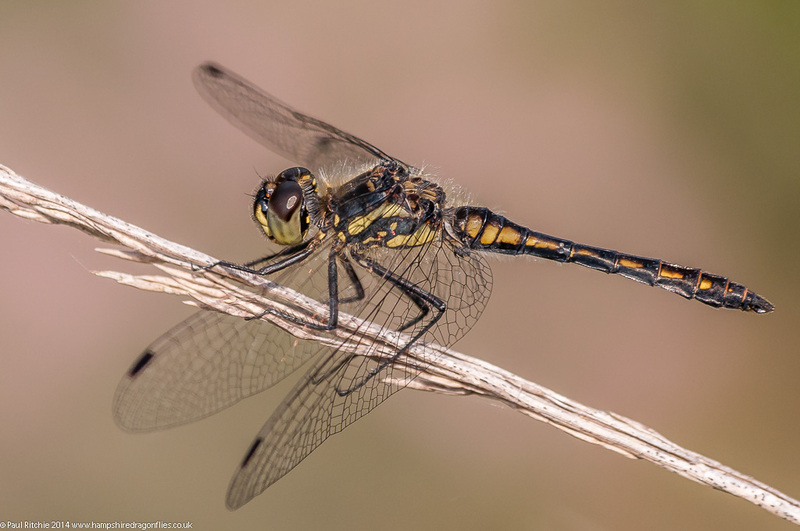 The main subjects were Black-tailed Skimmers – the best display I’d seen of these for a while, and certainly the highest activity of the day. Crockford was rather subdued despite the shelter. 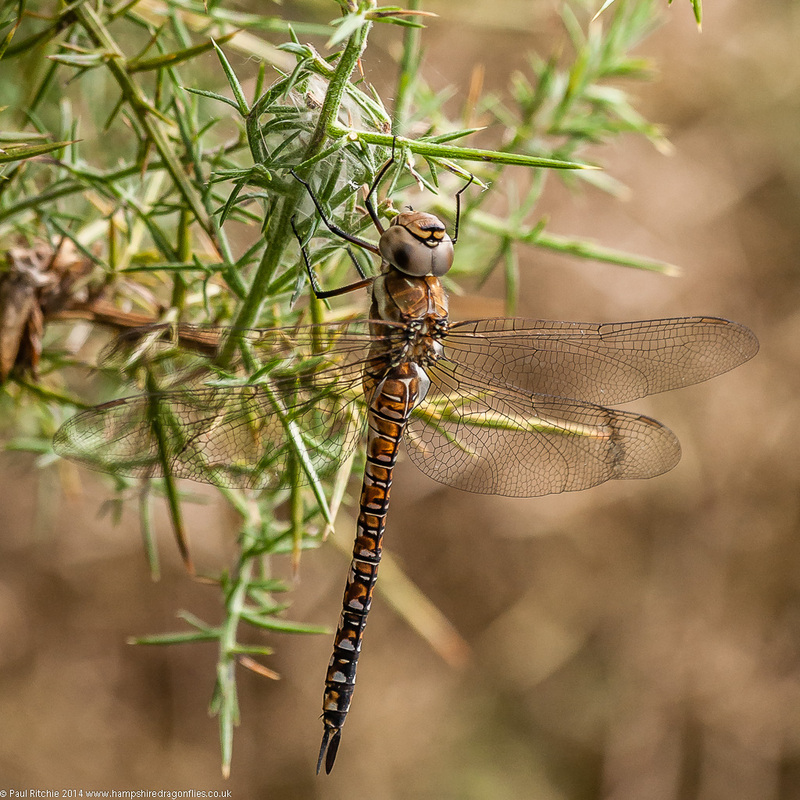 The strongest populations being Keeled Skimmers, a few Common Darters, a smattering of Beautiful Demoiselles, a few Southern Damselflies and in the corner a hawking immature female Migrant Hawker. After watching her zig-zag square dance above our heads, she finally settled in the sanctuary of a gorse bush. In the basin things weren’t much better under the cloud, but we did have one Golden-ringed blaze through before disappearing upstream, which is where we headed, searching through the heather and watching the few regulars lining the stream. Thankfully the sun broke through and the wind dropped a little. While I was traipsing around the basin, Robin called me over to a captive Golden-ringed happily showing and returning to a regular ‘natural’ perch. A few moments in his territory and we were accepted as no longer a threat. Our time was up all too soon and we stopped to grab a perfectly-perched female Beautiful Demoiselle at home on Bog Myrtle on the way out. A day of quality rather than quantity with more watching than photography, which means, even on a quiet day, Crockford can still deliver. (Perhaps foolishly) I’ve been trusting to karma a lot more. Another navigational blunder in the New Forest on Tuesday threw up some interesting finds but nothing worthwhile. Certainly a lot less than you would expect on such a ‘dragonfly-perfect’ day. The only thing I came home with were tired limbs, a little sunstroke and a clearer knowledge of where I should’ve been. Perhaps I should’ve stayed home? Or maybe the disappointment was preparing me for something better to come. An early start on Wednesday was ruined by a standing traffic jam at Lancing, pushing back my arrival an hour. More unwarranted stress and disappointment, but I remained positive that the pay-off would arrive soon. After the navigational blunders on my last visit, I headed to ‘the right footbridge’ over ‘the right stream’ at Old Lodge Nature Reserve in Ashdown Forest. Already I had seen Four-spotted and Broad-bodied Chasers at the upper pools, and it wasn’t long before I spotted the first Golden-ringed. 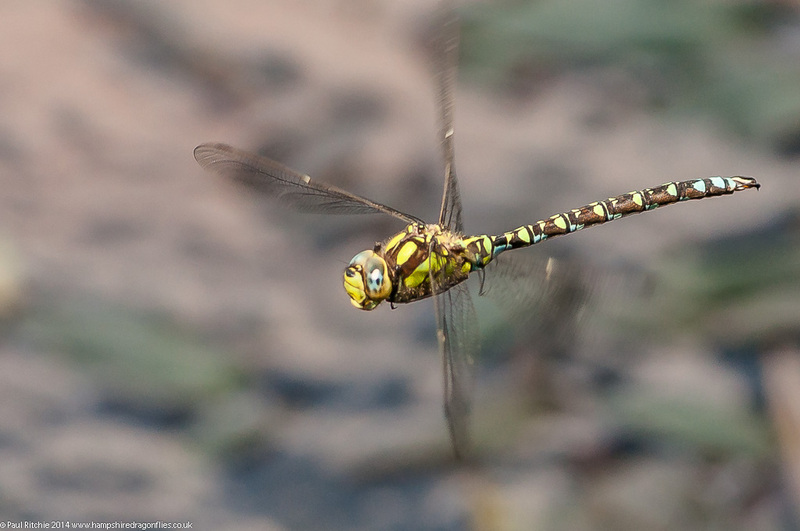 At the ‘key’ pool was a patrolling Brown Hawker; in my opinion one of the hardest to capture in-flight, let alone perched. I had a go anyway to get used to what I hoped would be a rapid-fire day. Although this little pool wasn’t spectacularly alive, there was always something to look at -whether it be a reasonable choice of damsels, a passing female Emperor looking for a spot to lay her eggs, several passing Golden-ringed, or indeed the target species I was specifically here for today. I had been at the pool for two hours before this fleeting glimpse; just enough to rattle off half-a-dozen shots before he disappeared upstream somewhere. While I waited for his return I walked back and forth along the stream to see if I could spot him, but the only larger species were more Golden-ringed or this male Southern who once again was choosing the dingiest, darkest pool to patrol. On the subject of Golden-ringed, while walking along the narrow path I had a male spring up from the heather and land on the arm of my t-shirt. I coaxed him onto my finger and studied his delicate beauty at close range before placing him back on the heather – no easy task as he found my finger comfortable enough. From one perfect moment to another as my target reappeared, this time spending fifteen patrolling low down along the pool. The good thing about this small pool is he didn’t have far to go, which made him easier to keep in view. After fifteen minutes of grabbing more or less the same shots, he disappeared underneath the bank-side heather – and didn’t come out. Slowly I rose from my vantage point and carefully peered over the bank to spot him perched! Such was my excitement I quickly grabbed a couple of shots, completely forgetting to adjust from in-flight mode; a schoolboy error I soon corrected as I twisted myself into a better position. I’d waited three years for this opportunity, and couldn’t quite believe my luck. The close encounter with the Golden-ringed had already made my day, but this was the proverbial icing. He rose to do a couple more circuits before disappearing upstream again, and as it was three o’clock I thought I’d take a slow walk up the steep hill back to the car, calling in at the pools on the way, but as I reached the bridge I found him taking residence usually favoured by the Southern. It was almost as if he didn’t want me to leave, and I obliged with a couple more in-flighters before he disappeared across the heath. Needless to say I only gave the pools a passing glance, fully satisfied and probably grinning at my luck today. Or was it karma? Touch and go looking at the weather for this weekend. Maybe a glimmer of sunshine, but the most important factor for Cliffe was wind speed. Last year we took a day and were frustrated by the heavy gusts, which more or less ruined the day for us. Today however we had sunshine as far as Clacket Lane Services, and then a heavy blanket of low cloud and fog which was beginning to burn off, but hadn’t by the time we arrived at Marshside. I wasn’t that bothered though…just a little trepidacious hoping we wouldn’t be disappointed. 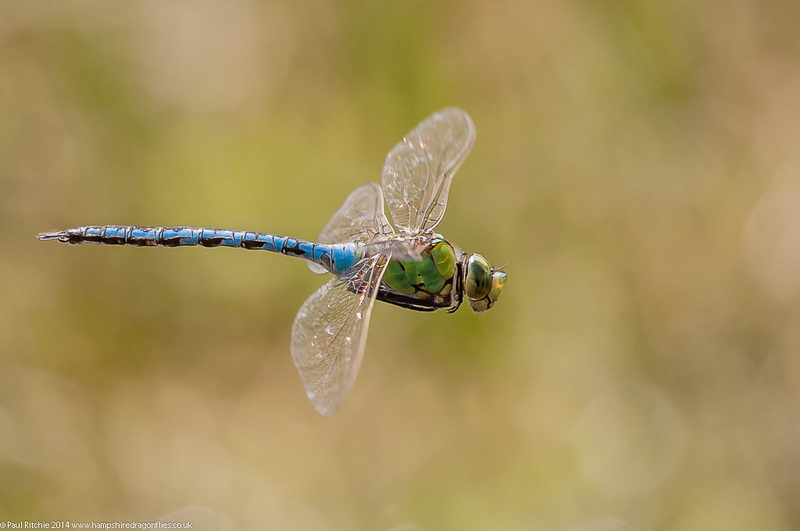 Just after the M2 ran out and turned into a dual carriageway, we turned off onto a narrow country lane which to all intents and purpose would probably be the last place you’d think of to look for dragonflies. Except for the ditch running parallel. 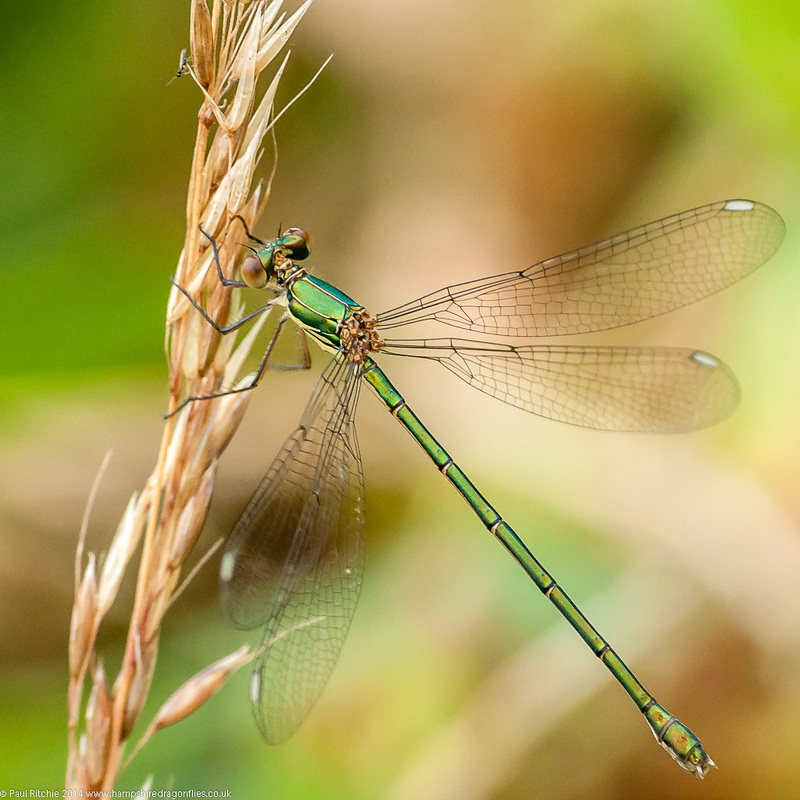 However this short 100 metre section of the lane was where we were directed, and after witnessing a few Blue-tailed braving the gloom I spotted my first ever Willow Emerald damselfly. The first thing which struck me was the size; significantly larger to the Common Emerald we’re used to. Not difficult to see when present among the tall vegetation lining the channel. When disturbed clumsily they would rise to the adjacent tree-line, very noticeable in their flight and seemingly larger in sight than tenerals you see rising into the stratosphere. Once we were satisfied that we had grabbed as much as we were likely to in the conditions, we braved the M2 for Cliffe – a site we’d visited a year ago for the first time. There had already been reports of Scarce and Southern Emerald and during our drive we witnessed a rare celestial body breaking through the cloud. The hardest part of a visit to Cliffe is the final stretch down a mile of pot-holed and precarious gravel track which in all honesty requires a four-wheel drive…or tank. Surprisingly – given my abhorrence to the M25 – was the worse part of our drive today. As a passenger a ride you wouldn’t go on twice at a fairground. Last year I chose to walk the most part. After what seemed like an age, we arrived at the parking spot to find we weren’t the only dragonfly enthusiasts here today. Crossing the gate we bumped into two chaps from Brighton who had already found their prizes; the Southern in the same bunch of thistle scrub we found the Scarce last season. The Scarce were seemingly everywhere. Males were scouring a large section of the ditch, and at first were hard to concentrate on among the rustling and splashes of Marsh Frogs jumping to the sanctuary of the ditch at our passing. The females were harder to track down today. I saw only the one single and lost her within the reeds. So in the interest of continuity I’ll repost the one I managed last season. 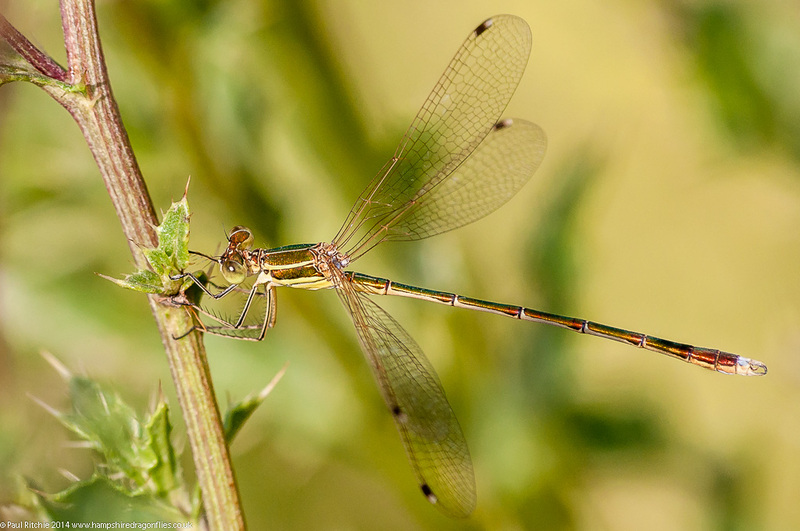 Later Sue pointed out a tandem pair jumping from one reed to another allowing the female to oviposit. A small, thistle-strewn section of scrub in the corner provided our first ever sightings of the (UK) rare Southern Emerald – a ‘lifer’ for me as was the Willow. I’m more than content. The Southern were found in the same small patch of scrub that we found the Scarce last season; which in all honesty I was expecting to find the bulk of the latter. But it was in fact the chosen place for the Southern, and I filled my boots (once again, not wellies for a change) and concentrated here for the time being. 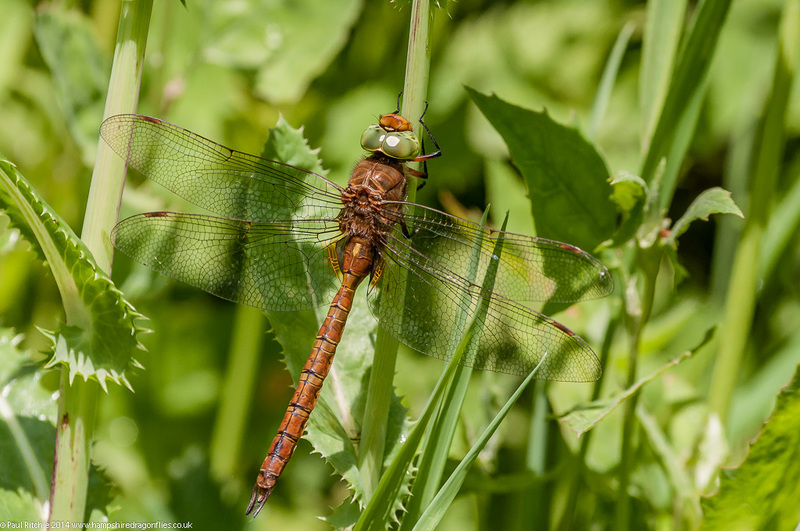 After my fill I carried on around the square border of the field, rewarded with the most fantastic display of Ruddy Darters – swarming in a way I’ve not witnessed since the annual Common Darter display found on Beaulieu Heath if you catch it at the right time. But today belonged to the Emeralds. A hat trick of rarities including two ‘lifers’. Thanks again to Marc Heath for providing location details for the Willow. 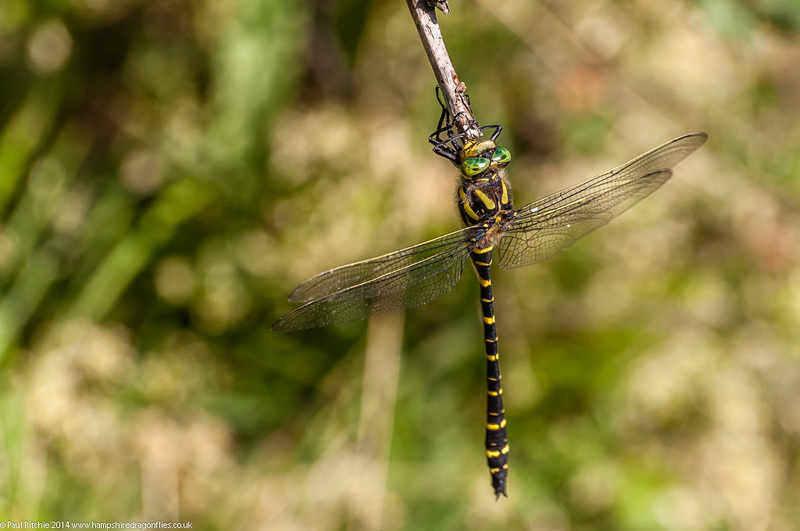 For many the Golden-ringed Dragonfly is a real favourite. Stunningly beautiful, sleek and efficient without the aggressive tendencies of the Emperor; choosing only to do battle with its own kind. Every July I look forward to spending a few hours at Crockford where I can just relax and take in the action at the basin, or more often choosing to explore upstream for quieter moments and engaging activity. At least once a year I’ll explore the other side of the road, or rummage around the flushes leading down to Hatchet Pond. All of these locations contain Golden-ringed, Southern, Small Red and pretty much everything else you’ll find at Crockford Bottom; it just takes a little more effort. Unusually I find myself in the situation of needing only a couple of species to complete my Hampshire list so now I can choose to indulge a little more without chasing rainbows, although I will be making the effort to add a few of the UK rarities over the next couple of months. In the meantime I’m going to enjoy some of my favourite New Forest species at some of my favourite New Forest locations. 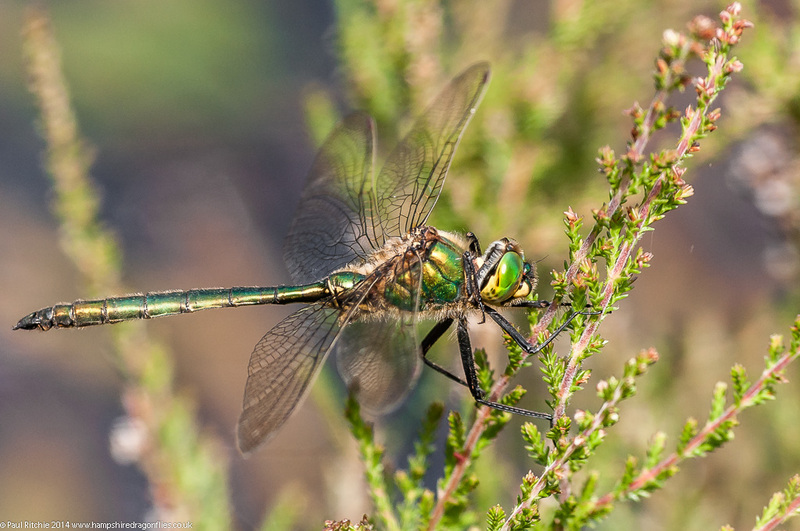 I paid a couple of visits to Thursley Common last month, almost a fortnight apart, the post lying on the back-burner in favour of the recent highlights. By the time I arrived the car park was already full with just the one space remaining. I immediately headed to the marshy area to observe the Four-spotted battling with themselves and a patrolling male Downy. Along the shore I counted another eleven Downy, and was briefly rewarded with a visit from a Brilliant Emerald, frustratingly chased away by one of the Downy. The very same thing happened at Warren Heath last season. Whenever the Brilliant would appear, he was chased off by by a Downy! Hopefully a little later the Downy populations will reduce enough to give the Brilliant a chance to stick around. I certainly hope so! 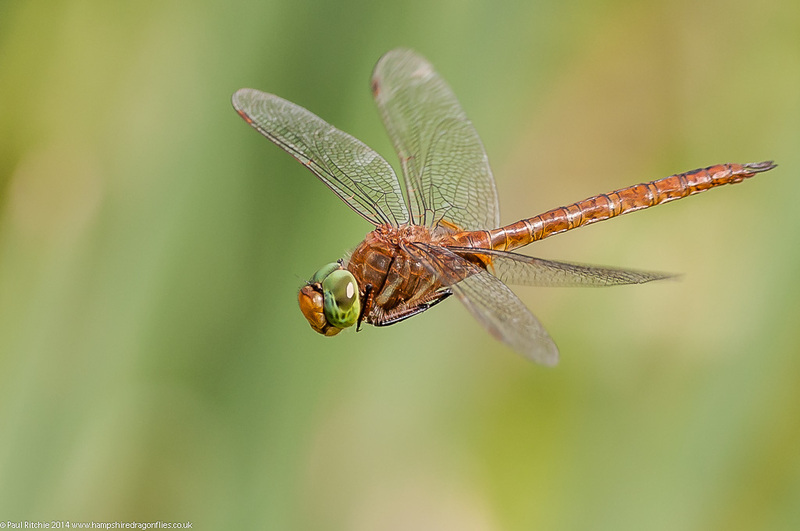 Once I had my fill of The Moat I did a circuit of the board-walk, entertained by a reasonable showing of Four-spotted Chasers, but nowhere near the levels expected. My objective was the stream, usually a miserable place to wait around at and not the best path to negotiate, but a glimpse of green forced me to stay a while. Only a Downy, but fabulously rising and scouring the surrounding heath before heading back towards the stream, slowly popping back and forth before disappearing over the heath. On the walk back to The Moat I searched the heather looking for Emerald Damselflies or indeed Black Darter, but nothing showed. 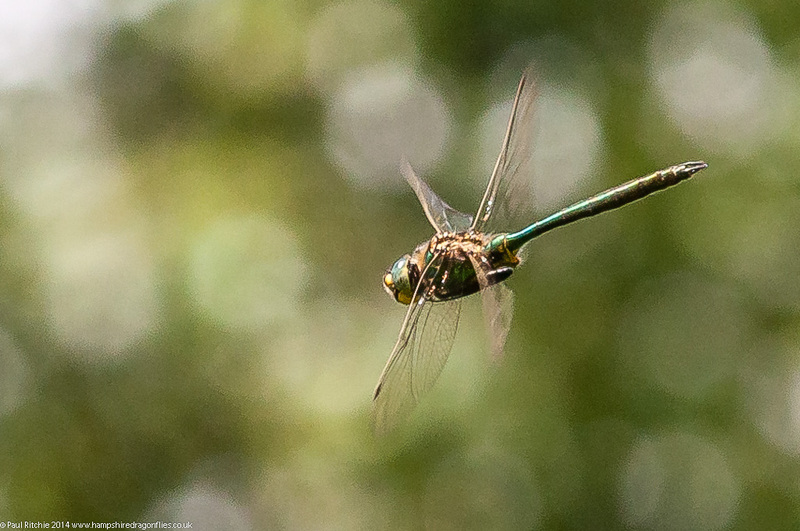 Plenty of Keeled Skimmer and a feeding Emperor along ‘hawker alley’ and among the scrub behind the pond. Back at the water the Downy numbers had reduced by half and several Small Red were decorating the marsh. 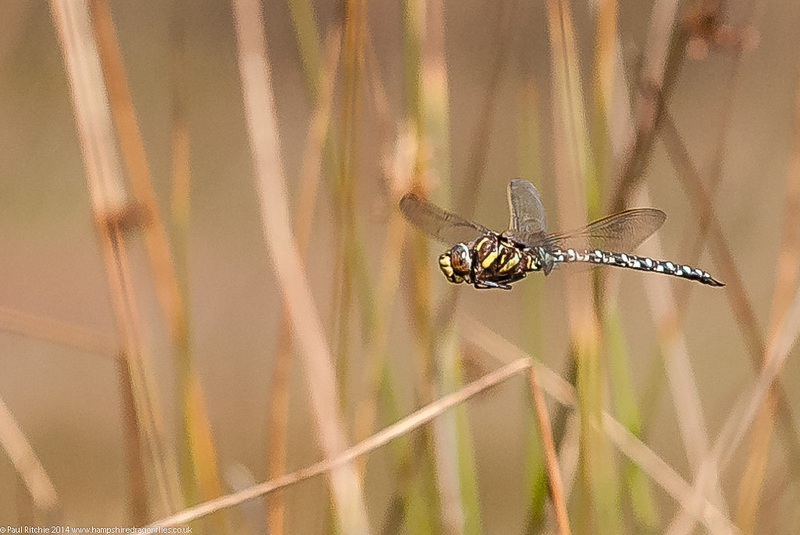 I returned to Thursley on a favourable day; plenty of sunny spells punctuated by light cloud. I did two circuits of the moat, taking note of every Downy I encountered; even stopping to grab a record in-flighter of each just in case my eyes deceived me. Alas, all Downy, but beggars shouldn’t be choosers and some of those present offered more than enough entertainment and in-flight practice. Some were taking a good chunk of bank-side territory, while others were choosing just enough to engage with. 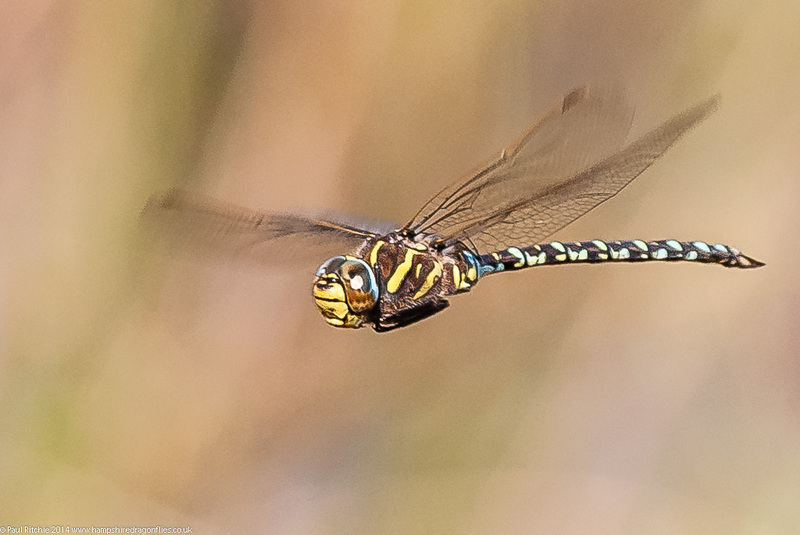 The individual above shared many characteristics with Emperors and Southern Hawkers, flying close in and circling, very inquisitive and almost prompting a switch to macro. For a change I took the path south from the moat, reaching a clearing previously discovered by entering via the village. This route was much easier and a bonus circuit to include in the future. 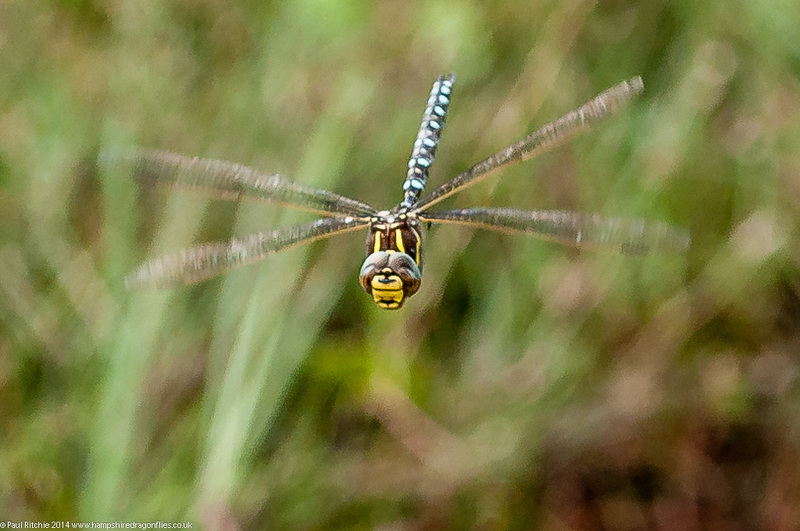 Returning to the board-walk I stopped at the peaty pool to watch an Emperor take charge over the few Four-spotted Chasers; not quite as engaging as the Downy but close enough to capture. 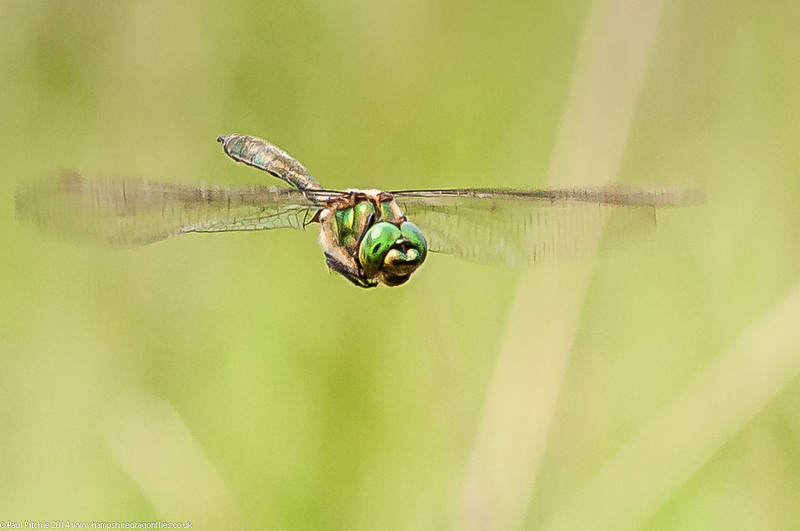 I followed the board-walk around the large basins, which today were swarming with Four-spotted Chasers. 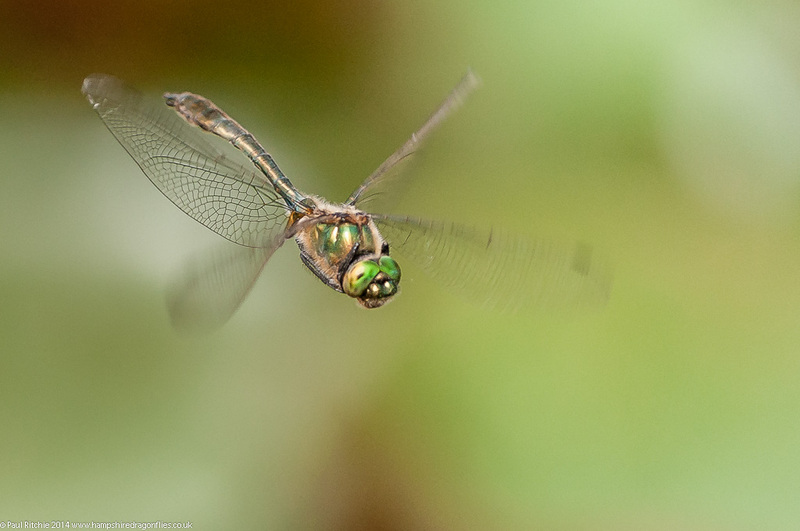 A supporting cast of Keeled Skimmers and more Emperors added to the enjoyment. I had to call in on the stream. Just in case. Nothing significant paid a visit in the half-hour I tolerated, so I busied myself amongst the heather on the path back. Bingo! Consolation in the form of several teneral Black Darters, including a mature female. 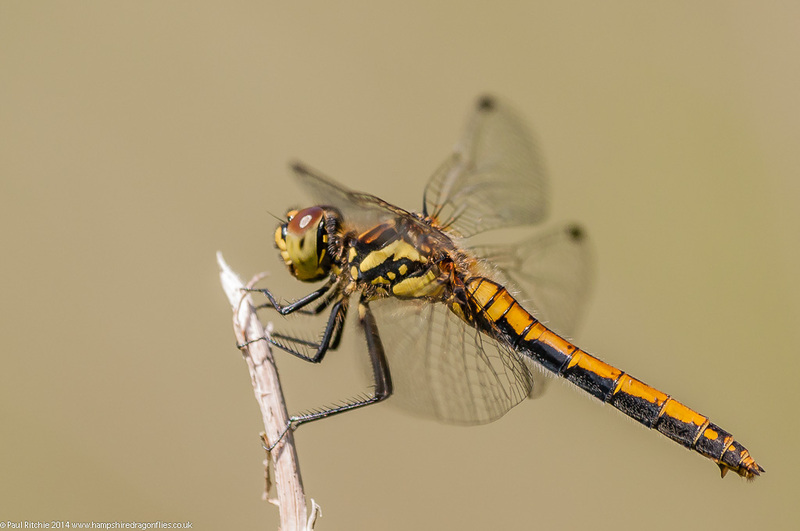 I’ve since heard they’ve also been spotted in Dorset and the New Forest, but it was a pleasure to engage with these charming little darters again; wherever they are. The Moat had calmed down a great deal by the time I returned, so I drove the short distance to Thundry Meadows; a charming little reserve on the banks of the River Wey.A complete contrast to the dry, flat heath of Thursley Common; lush long grasses and the river bank festooned with glittering Banded Demoiselles. I almost convinced myself I’d taken enough Banded photos this season, but several offered the perfect perch for seconds before disappearing deep within the grasses. Very lively, but I wouldn’t give up the chase for my first pair, albeit not quite in the wheel. 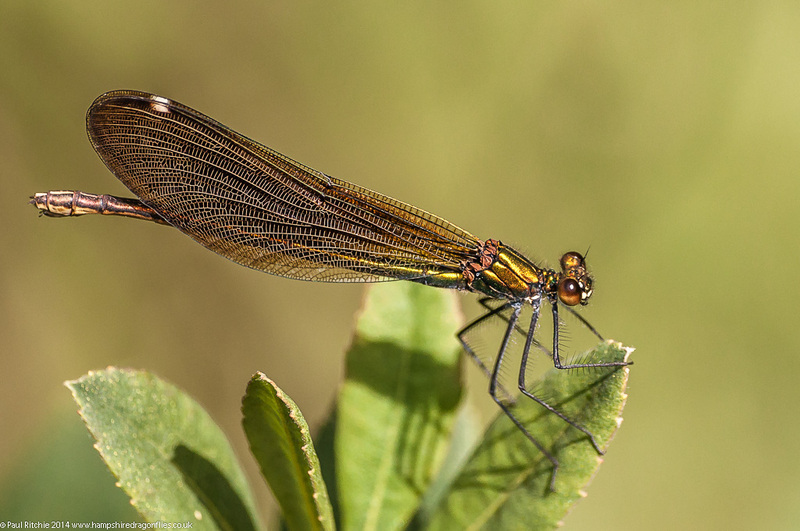 The only other species visible at this late hour were a few White-legged, the only damsel normally present at Thursley I hadn’t seen earlier. 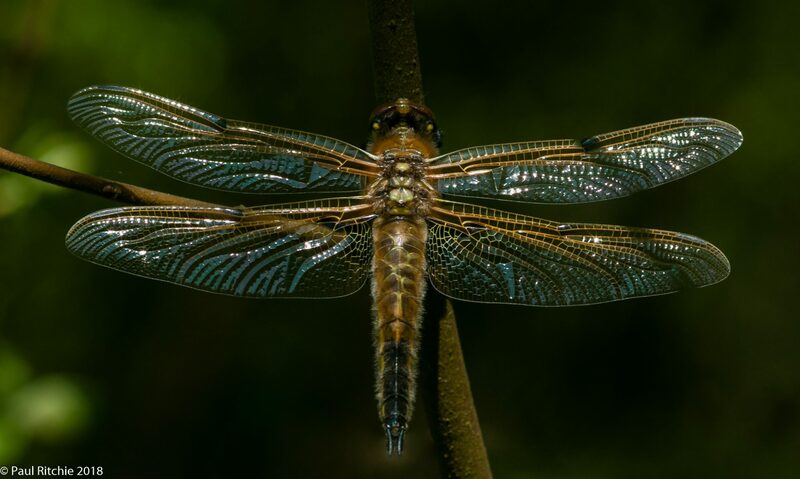 I often ponder on the similarity dragonfly photography has to fishing. First you have to find your location, wait for your target to arrive and hopefully catch something you can take home with you. I’d done my research; choosing the location based on plenty of sightings and photographs through Flickr, Facebook, Google and anything else I could gather. Their southern territory stretches only from Berkshire through Kent, including north Hampshire but populations are greater it seems further south-east, with The Weald being a hot spot. Steve Covey suggested I give Damian Keith a call, as he works close by and knows the area. He could make an extended lunch hour, so I arranged to meet him at Old Lodge. I’d been given instructions on how to reach the footbridge, stream and pools, but typically a wrong starting point can throw you completely! I turned left into a car park, obeying the sat nav for once, changed into my wellies and headed through the stone gates towards Old Lodge itself; a mistake that only became apparent once I’d reached the bottom of the mettled road. Frustrated that I’d had to retrace my steps – up hill in the heat before I’d even started – I decided to return and start again, stopping for a detour when I noticed the very small gate in the fence to the Old Lodge Nature Reserve. I turned left, went down the (rough) hill and realised it didn’t look right either, so I slogged back up hill again and returned to the car park. After a well-needed slug of water I skirted around and found a gate onto the heath where I’d seen some photographers. Surely this is the right place? After walking the wide path for a while, I realised this didn’t look right either, and finally had some sense to remember all streams are usually in the base of valleys. So I turned right and headed down hill where eventually I found a foot bridge over a stream. 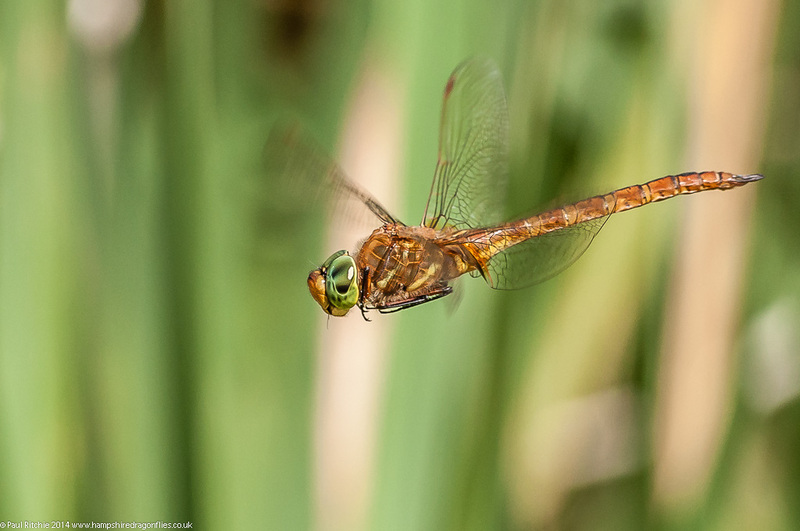 Convinced I was at the right spot, I settled in and stayed put when I saw my first dragonfly of the day – a male Golden-ringed patrolling the stream. However my second dragonfly of the day was my target; a superb showing of a male Brilliant Emerald hunting across the ferns in a clearing above a small open area of the flow. A spectacular sight as he circled above, below, up high, down low, far off and almost close enough to touch. This was in complete contrast to the individual we encountered at Warren Heath last season; that one was very low, barely a foot off the water as he skirted the bank. This one was more like an Emperor or Migrant, constantly flying overhead offering not-to-perfect views of the underside, reaching the treetops and dropping to the stream gully. His comfortable circling height appeared to be around nine feet above ground level. Emperors and Migrants however are a lot easier to predict. Each hunting session lasted around 15 minutes until he drifted off and returned to delight another three times before I received a call from Damian who said he was on his way. While I waited I crossed to the other side of the bridge to see the Brilliant was patrolling back and forth along a short section of open stream, albeit at the same three metres or so above the water, following the line of fern while a male Golden-ringed patrolled the same patch at their usual height – about six inches above the flow. 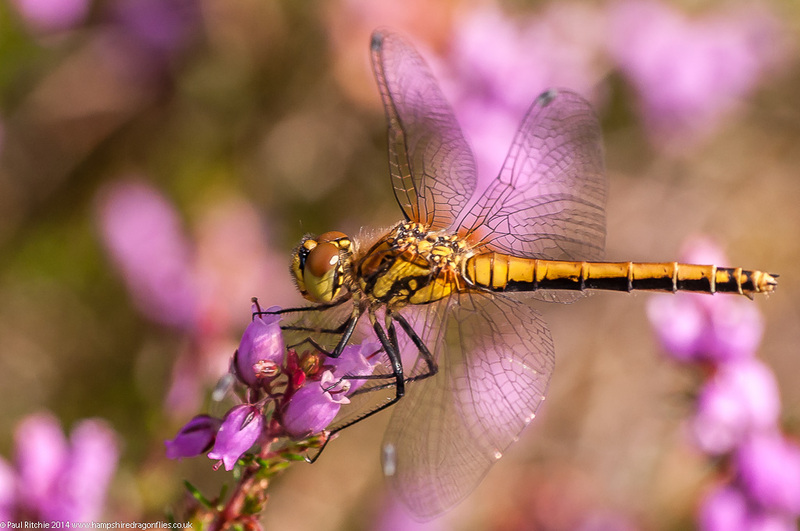 Shortly after a female appeared from nowhere and perched among the heather. She rose and headed down towards the stream, where the male found her and they both retreated to the safety of the tree canopy. I probably risked a heart attack as I puffed and panted up that hill to the road. I’m a big chap and hadn’t ran for thirty years. Apparently I’d parked at the wrong place too! Somewhat annoying to find the correct car park was merely a few metres further down the road. Through the gate, bear left with the path and continue down hill were my written directions. I found myself in a state of deja-vu as I realised I ended up at precisely the same place as earlier; inside the reserve proper but again on the opposite side of the ‘usual’ path. I didn’t give up this time, and when I’d gone as far as I could without trespassing on Military ground, back-tracked a little to a side path and – once again – headed downhill where a stream would logically be. Unsurprisingly his perfectly-perched prize had left not long before I arrived. I mean, come on…did I really expect it still to be there? Damien was apparently feeling more guilty than smug, but I take the philosophical approach to a missed opportunity. There will always be another chance. Our meeting was brief as by now he was beyond late back, but enough time to show me a couple of hot-spots and confirm my earlier individual was indeed a Brilliant. So you could say I’d achieved my goal. After he left I had a few more sightings of a patrolling male before the cloud appeared. 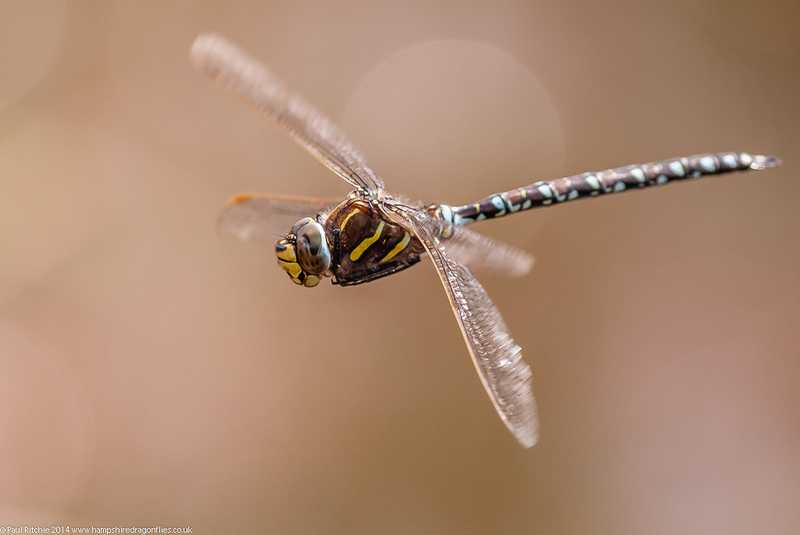 When it left (the cloud and the Brilliant) an unhealthy yellow haze dimmed the light, leaving only a couple of hardy Four-spotted Chasers and a female Emperor searching for places to shed her burden of eggs. Time to call it a day, and as I crossed the correct bridge over the correct stream to the correct path I noticed my first male Southern Hawker parading the small, dark area to the side of the bridge. I’d seen my first the previous day – a female hawking around the trees above Ober Water, but she disappeared before offering me a shot. I wasn’t going to leave without a record, and upping the ISO to a ridiculous 2500 I had a go. Today was a perfect lesson in misunderstood directions; a metaphor if you will for the job that is hardest is the one which is never started; or in this case, not started correctly. It’s all very well having directions, but paths can be very deceiving and look correct in unfamiliar terrain despite instructions gained through local knowledge. I’d been here before, in Berkshire and many other places, and I’m sure I’ll be here again. But despite my navigational mistakes I found my prize at another stream. Near another footbridge. And a perfect stream it turned out to be. Not to the activity standard of Ober or Crockford, but a place I’d gladly spend a few hours any time. On Sunday Sue and I took the long drive to Canterbury to meet up with Marc Heath as a returned favour for showing him the delights of Latchmore Brook a week previously. Surprisingly calm as passenger during the monotonous M25 stretch, and on approaching Canterbury eager to get started. And then it began; the stress levels rising as our route was closed for Sunday roadworks, followed by a diversion and a navvy crew flapping about with a level crossing! Finally we found ourselves down a narrow country lane and locating the pub we put into the sat nav (They’re another story). While we were looking for a place to park, Marc drove up and lead us further down hill to drop the vehicles. 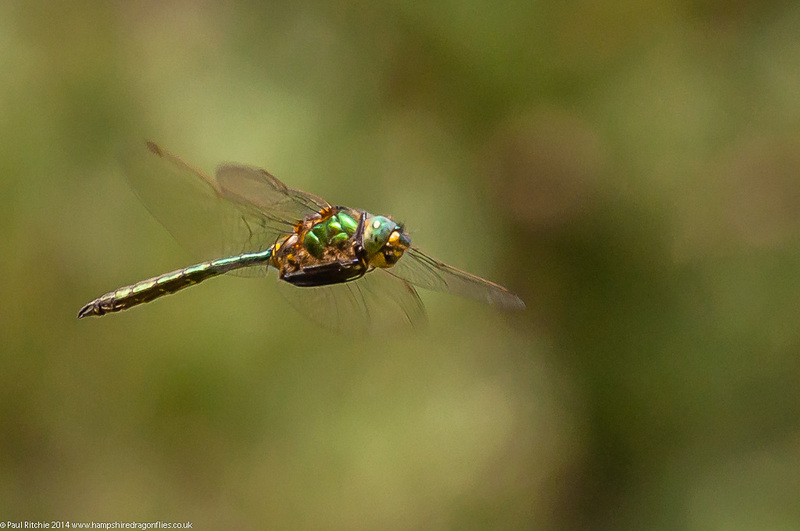 Shortly after we were entertained by a male hovering through his territory, occasionally joined by a male Hairy. Having found and shot my target I could relax, couldn’t I? I did feel like the proverbial kid in the sweetshop and needed to calm down and regain my focus. 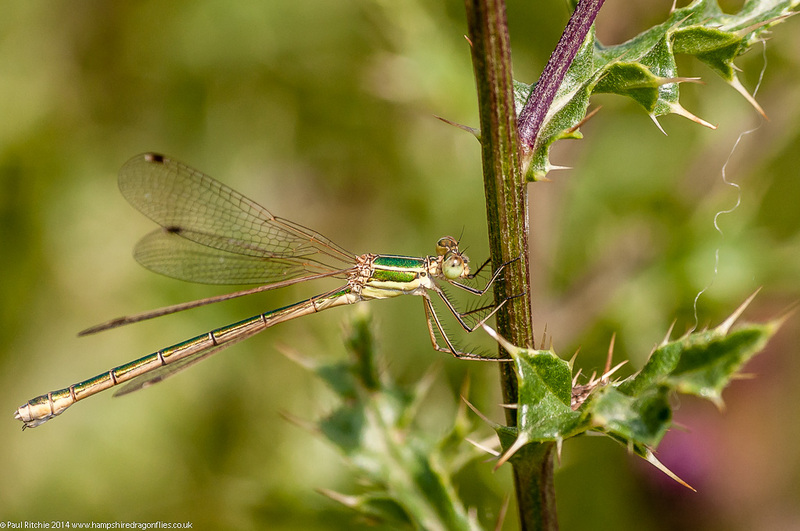 We took a walk along the River Stour, along a perfect path lined with ample foliage and supporting Damselfly cast. 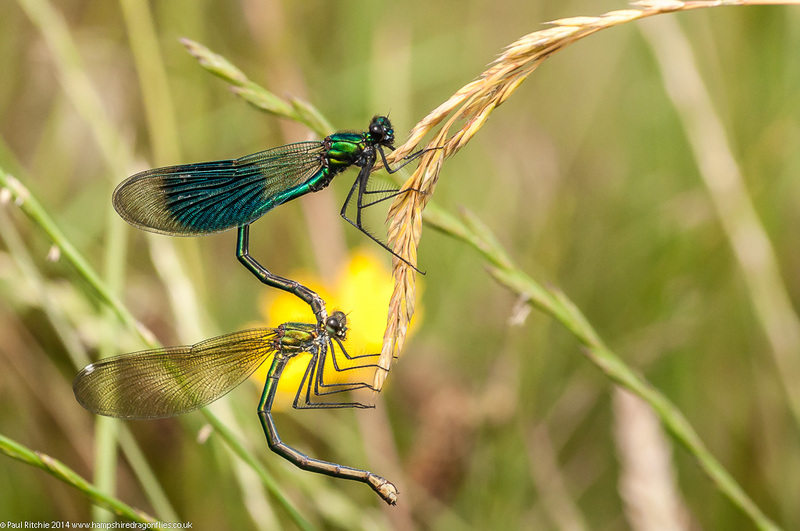 Banded Demoiselles, Azure, Common Blue, Blue-tailed and my first Variables of the season. This is the perfect place for hawking hawkers. Late in the day I should imagine it’s filled with feeding frenzy. In some ways it reminded be of the Somerset Levels, with a little Titchfield Haven and Blashford Lakes thrown in. 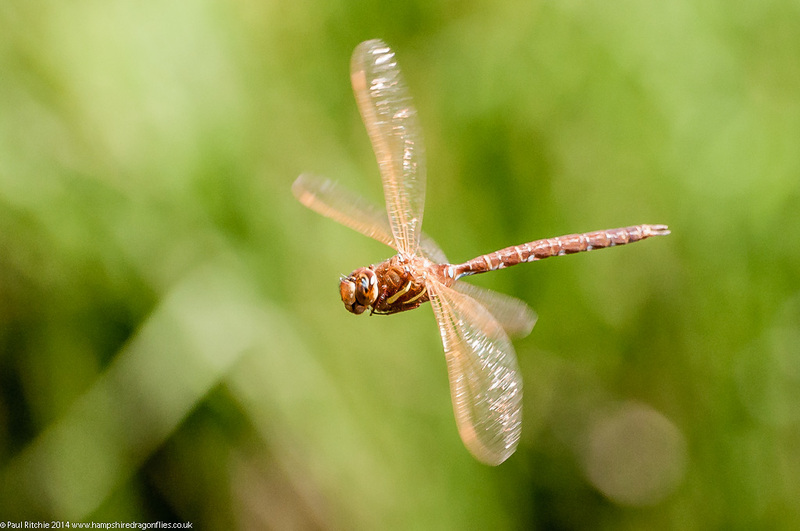 As if to prove a point we heard the unmistakeable sound of a disturbed Brown Hawker, rattling his wings in a frenzy to get airborne and away. Isn’t that always the way? 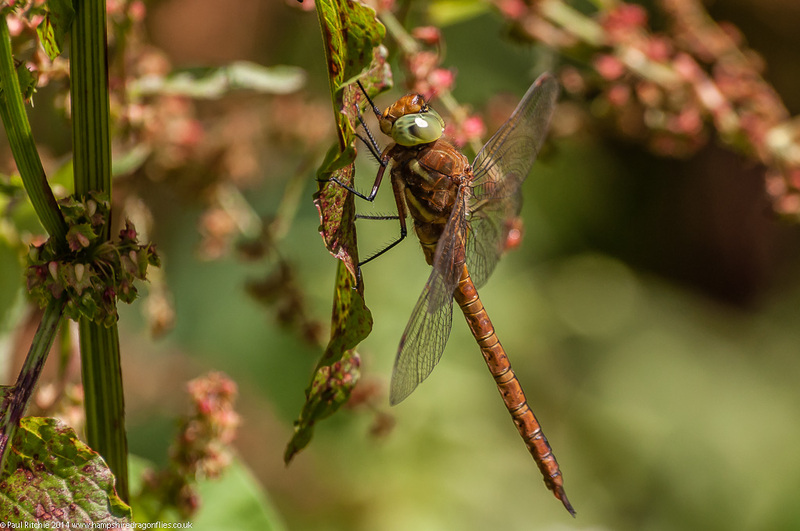 But a Brown Hawker. New species number three today. We walked as far as a perfect clearing – open to the river, bank half-lined with reeds and sheltered by the increasing breeze by a bank of trees. 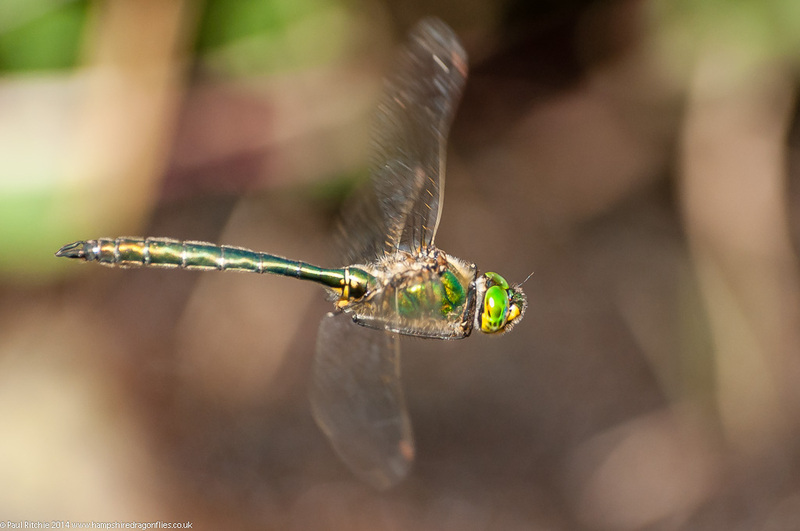 We already had one Green-eyed Hawker patrolling a small territory on the river, playfully circling around and above our heads and perching just wonderfully on the opposite side of the path. 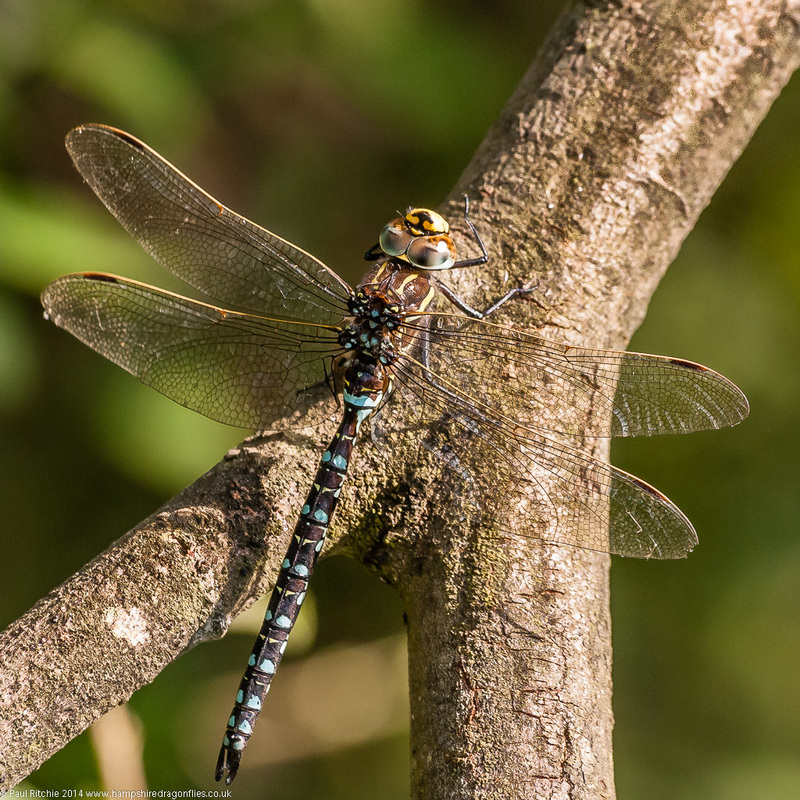 We spent a good while just here enjoying the show as Green-eyed Hawkers were joined by more nervous Brown and – new species number four – a male Migrant. Unfortunately no photograph, but there’ll be plenty of opportunities later on in the season. 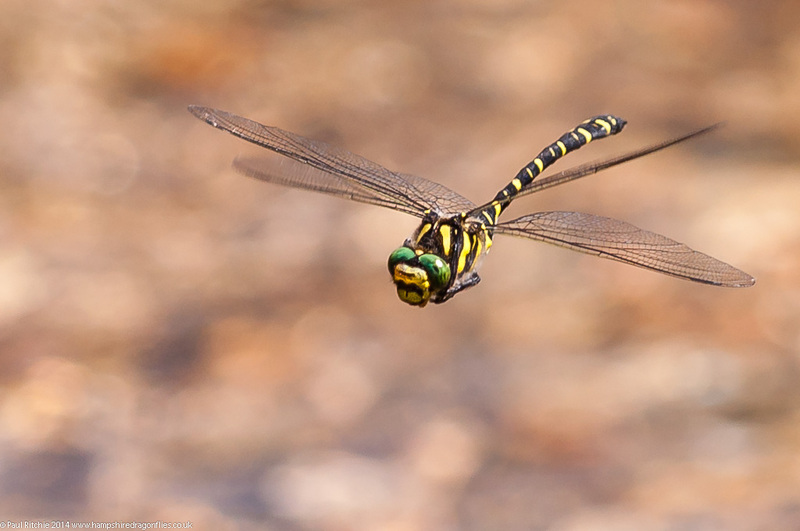 The jackpot would’ve been a Southern, but by now I am far from complaining as the male Green-eyed Hawkers were rather accommodating. 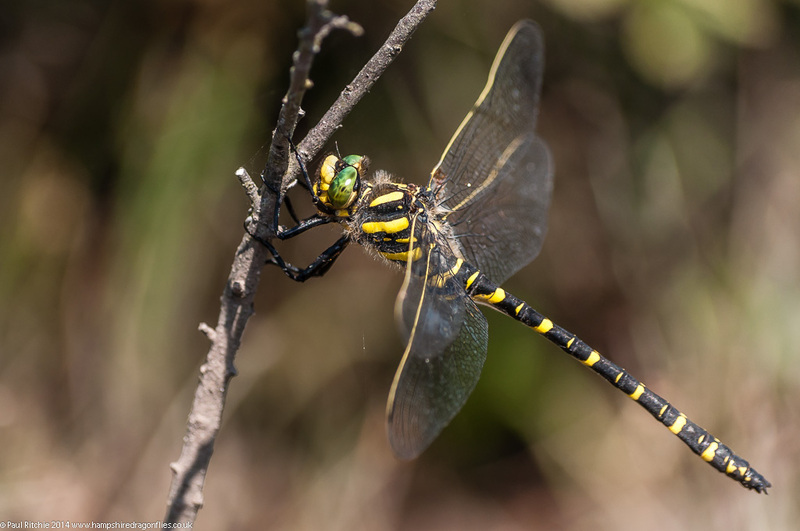 Further upstream was another small, sunny bay where male Scarce Chasers were parading along the bank, occasionally clashing with another resident male Green-eyed Hawker. 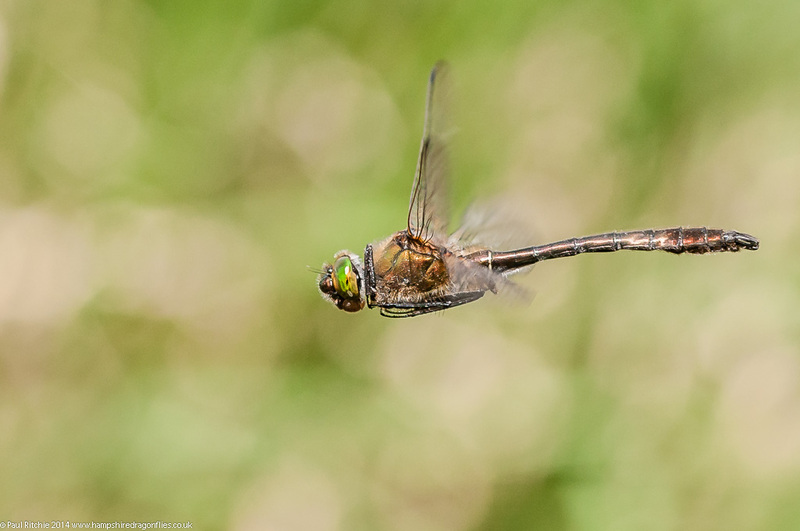 More Brown Hawkers were patrolling the far bank, occasionally flying in to perch briefly. They didn’t stay put though, nowhere near as trusting as their cousins. Back in the first glade my attention was engaged by the damsels. 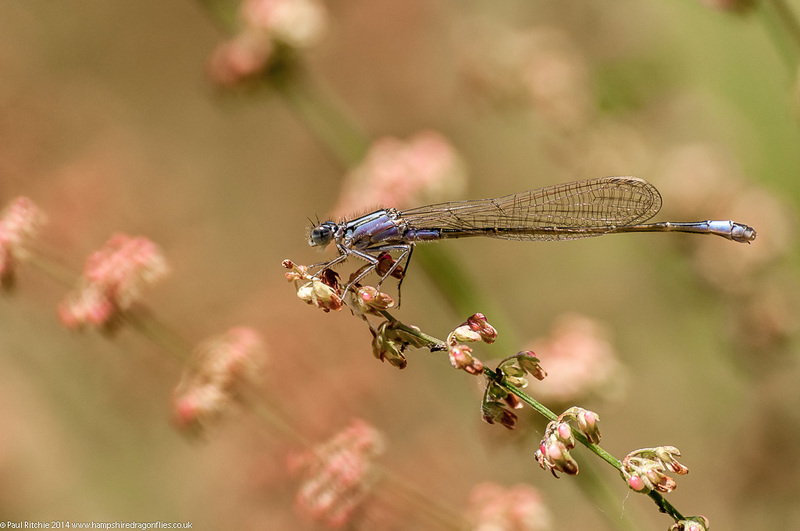 a beautiful immature violacea female Blue-tailed shimmered perfectly against a background too hard to resist. There were also several Common Blue in the wheel position. We could’ve stayed in this glade all day; and will admit to wondering what I was missing down at the channels. 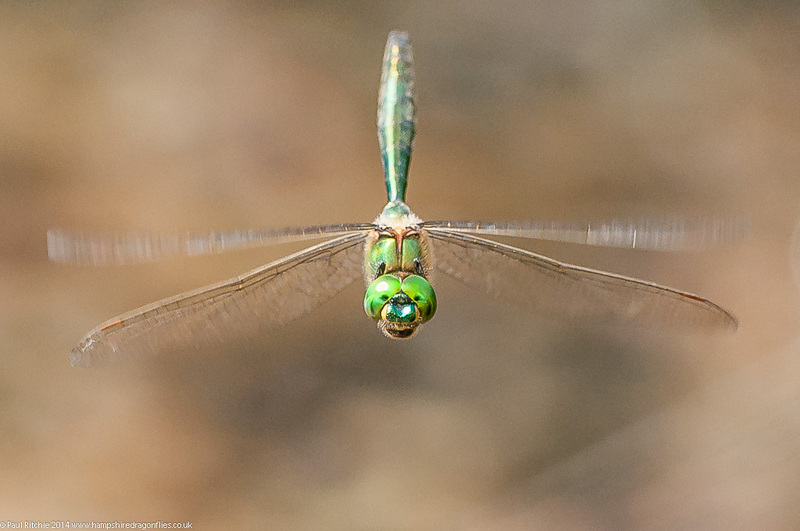 Having grabbed some perched shots I was happy with, it was time to get some in-flighters. By now the sunny spells were becoming more infrequent, and the breeze had lifted considerably, yet there were still three different males at varying levels of visibility, so I chose the more gregarious. I was getting a little frustrated with the wind and increasing cloud cover as I was waiting for my subject to come through again, but in all honesty the wind probably helped as I finally grabbed what was to become my shot of the day. A walk back along the river revealed the insects had already detected the incoming heavy showers well before we did, and with no more blue sky on the horizon it was time to call it a day. But what a day! 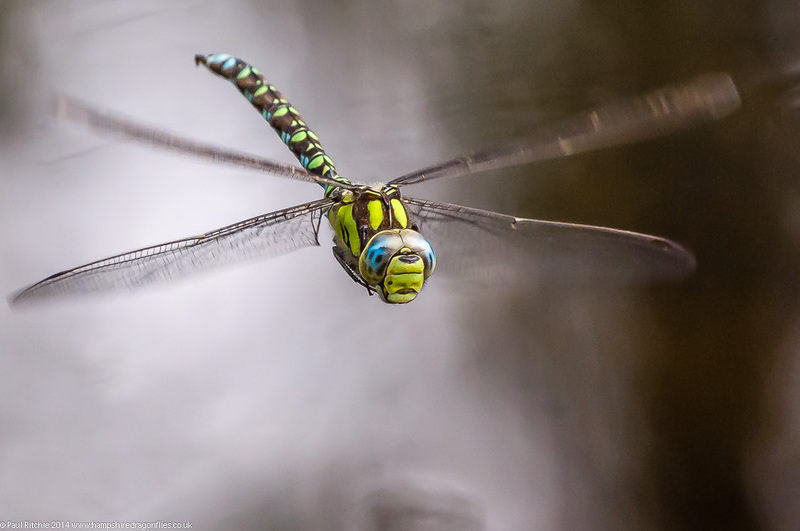 A great many thanks to Marc Heath for showing us around this fabulous place, and not least for providing my second – and far superior – connection with the fantastic Green-eyed Hawker.